Some of you don’t like Vista as its resource hogging and some even feel that its performance is really poor. So, such people usually stick to XP. But there are lots of people who like Vista user interface and eye candy features. They modify their XP desktop and other GUI to match with Vista. For this purpose they usually use transformation packs. You can find some transformation packs over here. If you have used Windows Vista you might have noticed the Welcome screen that pops up when Windows loads. In this welcome screen you can change and alter many settings. You can check your computer details, change desktop wallpaper, connect to internet, etc. Well, if you are interested in modifying, tweaking and making your XP like Vista then you might be also interested in getting the welcome center in XP. 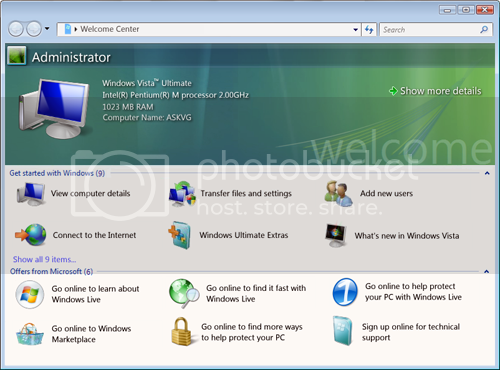 For this purpose you can try out a standalone application which helps you to get the same Welcome screen in XP that you see in Vista. Download the RAR file which you can find at the end of this post. Extract it to a specific location, you’ll get a folder containing the EXE file along with other required file/folders. Run “Welcome Center.exe” and enjoy the Welcome Center.